By Anneke Brand, IIASA science communication intern 2016. Accidents, lane closures, and congestion all affect the flow of road traffic and harmful emissions from vehicles. Live traffic data allow congestion to be detected more accurately and provide a more precise overview of vehicle emissions at different times and places. 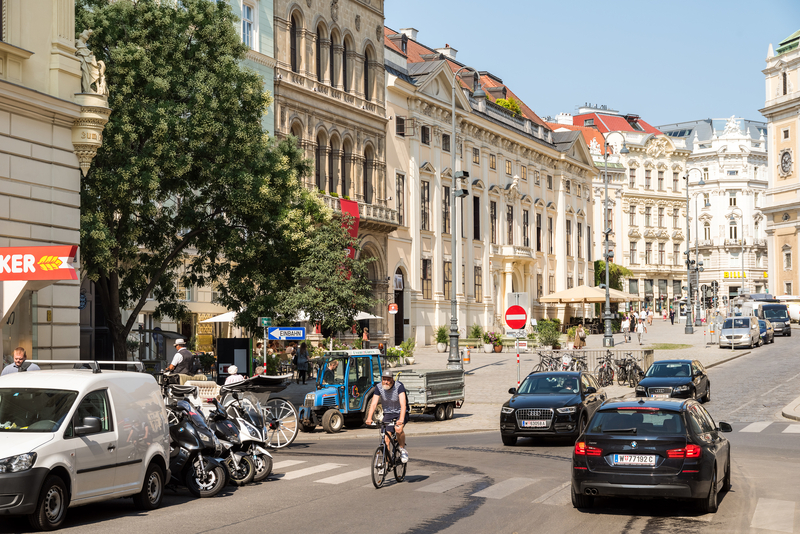 In his project for the Young Scientists Summer Program (YSSP), Fabian Heidegger investigates how road traffic affects air pollution in cities, using Vienna and surrounding areas as a case study. Air pollution is a major problem in Europe and globally. Health impacts of air pollution include a range of respiratory and cardiovascular diseases. “10-20% of Europe’s urban population is exposed to excessive levels of nitrogen dioxide (NO2), along with several other air pollutants. NO2 pollution is highest along busy roads. Technical measures have so far often been circumvented, so cities are looking for other measures to reduce the pollution load. Traffic management has therefore gained interest as a way to reduce air pollution,” says Jens Borken-Kleefeld, Heidegger’s study leader at IIASA. To calculate the amount of air pollution that cars and other vehicles release into the air, researchers use models that apply various sets of data: traffic networks, where and how far people drive, and emission factors of different vehicle categories. Input data for the model may include how many people live in a certain area, how many of them use cars, where they normally drive, and how many grams of pollutants (such as nitric oxide and NO2 gases) their type of cars emit per kilometer. Most of these models rely on average daily traffic data. For Heidegger’s YSSP project, which is related to his PhD work at the University of Natural Resources and Life Sciences in Vienna, he is incorporating real-time data, measured every five minutes, into a traffic simulation model developed by Intelligent Transport Systems Vienna Region. A set of detectors in and around the city record the number and speed of vehicles. In addition, location data from the taxi fleet is incorporated into the traffic simulation. Heidegger can therefore immediately identify adverse traffic conditions like stop-and-go traffic, which has a high impact on emissions. This allows for a more accurate calculation and can help design traffic interventions for improving both traffic flow and air quality. “In the case of a road closure, local emissions will obviously be lower at the specific road but total emissions for the area could be higher than before when drivers use alternative, longer routes or end up in stop-and-go traffic,” says Heidegger. In order to understand how these diversions and the displacement of pollutants can affect overall emissions, Heidegger will first determine the emissions per street section, and second, what the effects are of diversions from day-to-day traffic patterns. Together with researchers from the Air Quality and Greenhouse Gases Program at IIASA, Heidegger plans to assess the impact of different intervention scenarios, for example an environmental zone in the city, where only modern cars will be allowed to enter. In a second scenario he will look at the effect of people commuting to Vienna, and a third scenario will explore the consequences of expanding pedestrian zones. The researchers hope that this study will better their understanding of the potential of traffic management to reduce air pollution.